We have Big News! We are excited to announce that the BenderFitness team is growing. Jesse and I will be welcoming Baby Bender in late June or early July of 2016. We have been anxiously awaiting the right time to share our wonderful news with all of you. I am 12.5 weeks pregnant, and about to start my second Trimester of pregnancy. So what does that mean for BenderFitness workouts? I will continue to film new workouts throughout my pregnancy, barring any complications that would prevent me from safely working out. I will not be able to go as full out high intensity during my workouts, but that doesn’t mean you shouldn’t be pushing! I have been more tired during the first trimester (and filming far fewer workouts). So I have also decided to start the New Year with a 12-Week Workout Challenge made up of older BenderFitness workout videos. The nice thing about having over 700 workouts in the BenderFitness archive to choose from is that we always have options! I was torn between hosting three new 30-Day Workout Programs, or hosting my 12-Week Bikini Prep Program with some updated Diet advice and modifications. I have decided to create three new 30-Day Workout Programs that will combine both older BenderFitness Workouts and some of the new ones Jesse and I will be filming. I will also be hosting a new DietBet challenge for those of you with weight loss goals this year, to run along with the workout challenge. It’s been a year since my last DietBet challenge, but I saw people make huge progress with the extra motivation. I will be posting more about the challenge, so be sure to check back! I am excited to share another aspect of my fitness journey with you all! It will also be interesting to see how my body responds to pregnancy & post-pregnancy fitness. There are a lot of myths and rumors out there about working out while you are pregnant and I look forward to sharing a lot of helpful information about pre-and-post natal exercise as I embark on this new journey. 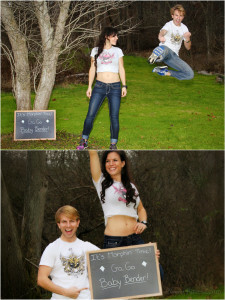 PS We had so much fun shooting our Pregnancy Announcement photos that I couldn’t choose just one to share with you all! Special Thanks to Lee Ann Freeman at Generations Photography & Specialty Gift Shoppe. She did our wedding photos and announcement photos, and I couldn’t be happier with how they turned out! Congratulations, Melissa and Jesse!!! God bless you and your growing family! Congratulations Melissa & Jesse ! Congratulations, you both will be great parents! Wow that’s great news it’s truly rewarding to see your own creation grow . I saw this on Facebook. It will be nice to follow along. Great announcement pictures btw. SO exciting! Congratulations! I am 16 weeks pregnant, huge fan of yours and workouts have been tough for me lately – I am excited to follow you on this journey! Congrats!! I was wondering when you all would be expecting! I worked out with you before , during and post pregnancy! I kept in shape and healthy during my pregnancy..and you have helped me get in shape post baby! Very, very exciting! So happy for the two of you, rock on in twos, and then threes! Congratulations!! So excited for the both of you. I had a feeling this was coming! You kept talking about how tired you were and I was really hoping this was why! I’m so excited for you both! Congratulations! Thank you for always keeping us informed on your life! I can’t wait to see Baby Bender! Congratulations, how exciting!!! Can not wait to meet the newest additions. My children, 5, of them have always worked out with me. Melissa, congratulations on the addition to your beautiful family! ! I am also expecting in July 2016. I would love to see videos specific to pregnacy and what to eat to be healthy. So absolutely excited for you guys!! CONGRATS!!! You are such an inspiration and also super looking forward to your pregnancy and (especially) post-partum workouts!! You guys will have the cutest kiddo!! CONGRATS again!! Congratulations!!!! I’m very happy for you two!!! Hugs from Spain!! Congratulations Melissa and Jesse! So happy for you both! Thanks again for all your wonderful workouts and inspiration. I’ve been training with you for the last six months and really enjoy your workouts. Yayyyyy! So excited for you and Jesse. This is going to be THE BEST time! Wow! great news for you guys! As Baby Bender is growing, you can always make Jesse do some of the workouts. ;). He does a great job. I’m so glad you’ll be sharing your journey through pregnancy & staying fit. There are a lot of myths surrounding the topic and I think it will be good for you to discuss those. Looking forward to it. Fitness challenges are great — even if they are made up of older workouts. Just bringing them up again kind of makes them new! You & Jesse will make such fun parents. Blessings on your pregnancy. Really very happy for you both. Pregnancy is an adventure and life with children is an even bigger one and I’m sure you will both enjoy it. Congratulations! Congratulations!!! I am so happy for you and so excited to see your maternity workouts for the future!!! 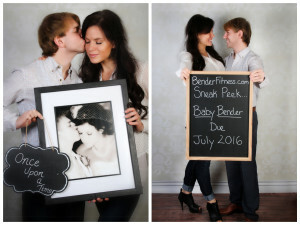 You will be wonderful parents and I cant wait to see baby bender burpees!! So happy for you guys !!! This will be your biggest challenge ever but this will be the greatest for sure !!! How wonderful! Congrats to you both! I cannot wait to follow your maternity fitness program. I have been following your workouts since the birth of my second child and they changed my body dramatically. You are amazing, an inspiration and an overall lovely person. I am 21 weeks pregnant with my third, and burpees are looking kind of funny at this point, but we will push on together!!!!!! All the best to you. Congrats Benders! You’ll be amazing parents! I’m SO excited to be pregnant alongside you! I’m 11 weeks and I’m finding it so hard to have the energy to make it through the workouts! I’ve mostly been doing the weightlifting routines because high intensity is too much right now. Can’t wait to see the workouts you put together! Here’s to happy, healthy momm as and babies!! Oh my gosh! Best news ever!! I have been following you for over 3 yrs now and am. Huge fan. Pregnant with baby number six due July 2! I get so sick my first trimester that I physically can’t do much of anything.. And I lose all the muscle I had before getting pregnant.. I’m excited to go through the journey with you. I think workouts designed just for us pregnant ladies would be awesome! Kids are the coolest. I feel so happy for you Melissa and Jesse. Congratulatios!.You are in my prayers to God to the whole precess of pregnancy is perfect. A greeting from Puerto Rico. Yea!! Congrats!! I am 21.5 weeks pregnant with my second child and am still trucking along with your workouts I am also having to make some modifications LOL. It’s a fun journey! I KNEW IT! THERE WAS JUST SOMETHING NOT RIGHT ABOUT YOU NOT FILMING. UNDER THE WEATHER HUH? SINUSES? CONGRATS TO EACH OF YOU. HOORAY and CONGRATS Melissa and Jesse!! What an exciting baby journey you two will share together! ❤I can’t thank you both enough for all your hard work and dedication to putting these excellent workouts out here for us all to keep in shape and healthy! Your workouts have helped me transition successfully from working out in a local gym for the last four years to the comfort of my own home now for the past year!! Congrats! You look so awesome!!! OMG how exciting! I can’t wait to follow your workouts and your pregnancy journey! Congrats! Congratulations, Jesse and Melissa! This is one lucky baby!! I can’t wait to see you rock some adorable maternity workout clothes! So happy for you two! I now know why there were so many repeat workouts. But I feel ok knowing you have a billion workout videos to choose from while you’re making a human. I am so happy to hear of you both having a little angel coming along……babies are Miracles from above and we are so privileged to be able to teach these munchkins everything we know especially love, commitment, and sacrifice and as I can already tell you both are great at all these! God Bless you three!! Merry Christmas! I’ve had a feeling for a while now that you were maybe hosting a wee bun in the oven! Nothing to do with your appearance. Just… I guess it’s fellow mom’s intuition. 🙂 so glad the first trimester has passed safely and all is well. It will be amazing to see you change and blossom in this way. yay! Very sweet. Saw the posting on Twitter earlier today but wanted to say congrats again. Congrats! I too am expecting now 11 weeks and due beginning of July! As I saw your announcement and read your plans I hoped you would be posting work outs suited for your changing body. I hope you can still show what modified moves are best for pregnancy as well. It’s so important to me to still work out and I’m happy to grow with you! I absolutely will be! 🙂 Plenty of pregnancy workouts & pregnancy specific information will be posted. Oh that is such lovely news, congratulations. Very happy for both of you. I look forward to the new workout plans! I, too, was growing suspicious of the tiredness and repeat workouts. Totally understandable! Congrats to you both! May the Lord guide you all safely through this pregnancy. I have been working out with you for two years. I started when I was on maternity leave with my second. You have pushed me and allowed me to workout when there would be no other way to get such great benefits in quick time. I have changed the shape of my body with your videos and running. I ran a half marathon when 12 weeks pregnant with my second. It will be so great for other pregnant women to have workouts they can go to and safely stay in shape. Congratulations to Melissa and Jesse Bender! Congrats to you both…I’m a fan of you Melissa. I have 3 beautiful kids and my last one is 18 months old. Yes, please we need a lot of information about post-pregnancy exercises. Thank you and bendiciones! Congratulations! I am also expecting a baby late June/early July. I have been doing your workouts for years and always find a way to make them work while I am pregnant. I was so excited to see that we are on the same timeline. Thanks for all the great information and workouts. Good luck with pregnancy! Congrats! You guys are the best!!!! Melissa, I am thrilled with your news & LOVE your pics! So adorable! I will be praying for a safe, happy pregnancy for you & a healthy baby in June/July. May God bless you both and me He draw you to a close relationship with HIM as a heritage for you to pass on to your new baby. Love to you– & squeals of joy on your behalf!! It’s funny, I’ve been having thoughts of you two having a baby!!! LOL Maybe being a mom myself I was having some intuition. I am beyond thrilled for you and Jesse. Maybe in the near future we will see both your cat and your baby crawling across your yoga mat during filming. 🙂 Many blessings Benders! Congratulations! Been following your videos for a long time. Thank you for all you do. Excited to see your fitness journey through pregnancy. Congrats to you both!